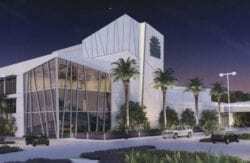 Serving both Pasco-Hernando State College as well as the Pasco Schools communities, the new PHSC auditorium will be an exciting and contemporary performance site, well-appointed for the PHSC’s lively music programming and other production events. TSG is working closely with Harvard Jolly Architects providing consulting for acoustics, theatre design, and theatre systems. The audience chamber will feature 600 seats. The stage will feature a contemporary stage, full fly tower, and stage rigging systems to enhance a variety of events. Additionally, a complete orchestra acoustical shell will be integrated to maximize concerts and music, and state-of-the-art lighting, video, and audio systems will complete the project.